LETTER FROM THE PRIME MINISTER OF THE TRANSNATIONAL GOVERNMENT OF TAMIL EELAM VISUVANATHAN RUDRAKUMAREN, ESQ. The Government of Sri Lanka is in retreat, with its tail well between its legs. 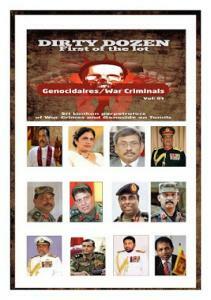 The international civil society has acknowledged the extent of the atrocities on the Tamil people leading to genocide. The Human Rights Council has called for an international investigation. The UN High Commissioner for Human Rights has placed Sri Lanka on a watch list for four years. Instead of pursuing remedial justice, the chauvinist mindset of the Sri Lankan Government has sought to create smokescreens to hide its multitude of sins. Its campaign against the Tamil Diaspora which it brands as consisting of “terrorists” is misplaced. The Diaspora entities, including the TGTE, operate in accordance with the laws of the states in which they function. They consist of citizens in those states who are committed to pursue their political objectives in accordance with the laws of their home states. The Sri Lankan Government commits an illegality in branding them as “terrorists” without any proof that their activities are illegal. The project of finding those guilty of Tamil genocide is being pursued by the TGTE and through lawful means. Today, we arereleasing the names of the “Dirty Dozen,” the first batch of the lot. More names of perpetrators will follow. This first lot includes names of current President, a former President, several diplomats and military leaders. Transnational Government of Tamil Eelam (TGTE) today released the names of its first lot of Sri Lanka’s War Criminals and those committed genocide against Tamils. This year marks the 5th anniversary of the mass killing of Tamils by the Sri Lankan security forces in the final months of the war in 2009. These killings prompted UN Secretary General Ban Ki-Moon to appoint a Panel of Experts to report on the scale of killings. According to the report by this UN Panel, tens of thousands of Tamil civilians were killed (UN Internal Review Report on Sri Lanka: over 70,000 Tamils were killed in five months in 2009). These people were killed due to deliberate and intense shelling and bombing of areas designated by the government as “no-fire zones”’ where Tamil civilians had assembled for safety. The Sri Lankan Government also restricted food and medicine for Tamils, resulting in large numbers of people dying from starvation and many of the injured bleeding to death. Former President of Sri Lanka from November 12, 1994 to November 19, 2005. Secretary to the Ministry of Defense and Urban Development. Appointed by his brother who was elected President. Former Army Chief/Commander of Sri Lanka Army and former Chief of Defense Staff (appointed by President Mahinda Rajapaksa)(resigned on November 16, 2009). NOTE: He was the Deputy Ambassador of Sri Lanka to Switzerland, Germany and the Vatican but was stripped of his diplomatic statute due to allegation of having committed war crimes in 2011. CURRENT POSITION: Deputy Permanent Representative to the UN in New York. He was also appointed to be on the Special Advisory Group on Peacekeeping Operations in January 2012 but was excluded from participating in the committee. Current Position: Deputy Head of Mission of Brazil. TITLE: Former Commander 52nd Division (2002-2003) and former Security Forces Commander – Jaffna (December 2005-2009). CURRENT POSITION: Governor of Northern Province. Transnational Government of Tamil Eelam (TGTE) is a democratically elected Government of Tamils (from the island of Sri Lanka) living in several countries. It held internationally supervised elections among Tamils around the world to elect over 132 Members of Parliament and is leading a campaign to realize Tamils’ political aspirations through peaceful, diplomatic and democratic means. TGTE has a bicameral legislature and a Cabinet and held one of its Parliamentary sittings in the British Parliament. The Constitution of the TGTE mandates that it should realize its political objective only through peaceful means.